Please review our Rate Card. How do I book a session? Please contact Greg Hartman greg@lionfox.com to discuss your project. How many hours do you think you need? How many musicians, mics, needed? What is your final product? Band recording for full length commercial CD? Band recording for a demo tape? Over Dub session, adding tracks to an existing project? 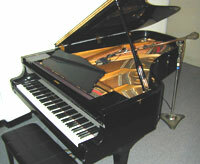 Your Yamaha C7 Grand Piano, is the most popular acoustic studio piano and most recorded in the world. Does it cost extra to use your piano in our next session? A non refundable prepaid rental fee of $150.00 is required, prior to your session. The piano will be tuned prior to your session. Your recording is forever. Much like a guitarist tunes before each take, tuning the piano before a session is the only way to insure a lasting recording. We love our grand piano. It has great action and is voiced for a smooth full range sound with an incredibly clear low end. Needless to say, our piano tech is the best. Can we use your Pearl Professional DLX drum set? Yes. There is no charge to use our drum set. Still to insure you get the sound you expect, you should bring your own snare drum, cymbals, and pedals. 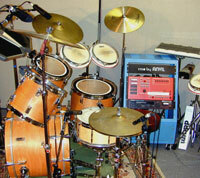 For jazz music we recommend you bring your set or contact Drums Unlimited next door to choose from the best drum sets. How can we rent a particular instrument? Drums Unlimited, located down the hall, has Hammond B3 w/ Leslie, all popular keyboards, guitar amps, percussion instruments and the finest selection of drums to chose from. Please contact them directly to arrange for your instrument to be delivered, ready and waiting for your session. I need you to mix the tracks I have already recorded. What is the procedure? This is very common practice no matter which workstation you use. - Create a folder for each song. - Put all the audio files of consolidated tracks for each song into their respective folder. - Send these entire folders to us. 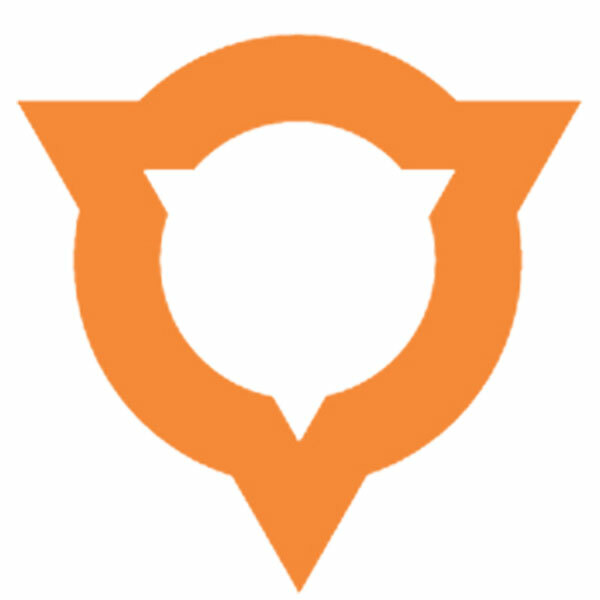 - dropbox, Hightail, WeTransfer or others are common ways to send files over the internet. - or simply put all file on a portable usb drive, bring or send it to us. If you do not plan to come to the studio in person (also common) we will sending you mp3 mixes for your review. We can make corrections per your comments until approval. I use Cubase/Nuendo. How do I make consolidated files to send to lionfox? - in Cubase we will use the Bounce command to achieve this. - set Record File Type to Broadcast Wave File (.wav) (BWF). - If you use virtual instruments, you must turned these tracks to audio wave files first. - Check that your project is set to Bars and Beats and that the tempo is that of the song. - Turn on Snap to Bar, set to Bar. - File > "save as" the project for safety, before the consolidation. - select >Audio > Bounce Selection, select Yes to replace. New files named the same as the track name will be created. Then play and check that the project is all there. If needed, go back the the "save as" project to correct. - Save and close Cubase, go to the project audio folder, sort by Date, Copy or Move all and only the new files just created to a new folder named the same as the Song title. - Copy the new song folder to send to lionfox. I use Protools. How do I make consolidated files to send to lionfox? I use Logic. How do I make consolidated files to send to lionfox? Surround Sound Mixing - Experience the magic of Surround Sound, 5.1 mixing. Discrete, Dolby and DTS formats. Mix to picture for DVD and video. MIDI - Transfer your MIDI file sound module tracks to .wav files in preparation for overdubs and mix.